I am sure of one thing that if you were growing up in the late 80s and 90s, then you must have played Super Mario or Pac Man. Besides, who doesn’t know about Candy Crush, Angry Birds, Tic-tac-toe, or the famous blackjack! Yes, I am talking about indoor and outdoor games here. We have survived our summer holidays on video games, which has now got replaced by game applications available on the mobile phone and certain social media platforms. So, ladies, if you have loved playing such fun games during your childhood (or even now), then why not flaunt your love and passion for it through your fingernails? 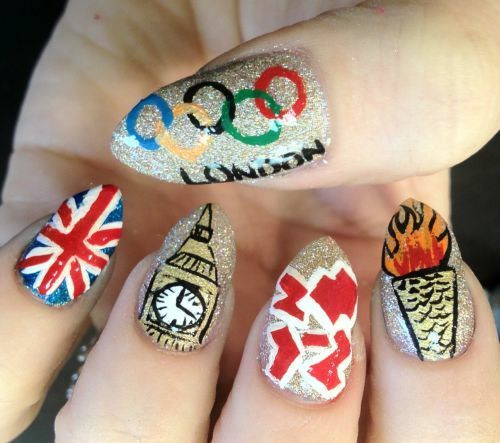 Zuri brings to you 16 amazing nail art designs inspired by games of all sorts. Even Olympics! 1. Clean your nails and shape them properly. 2. Apply a layer of base coat to prep the nails for the design. 3. Now, choose 3 different shades of base colors for your ring finger, pointer finger and the remaining 3 fingers respectively. Apply two coats of the chosen base colors, for instance, shade white on your ring finger, shade silver on your pointer finger and mint green shade on your thumb, middle finger, and the little finger. 4. Apply two coats of the chosen base colors, for instance, shade white on your ring finger, shade silver on your pointer finger and mint green shade on your thumb, middle finger, and little finger. 5. Now, use a thin nail art brush and dip it into another shade to sketch a grid on your ring fingernail with four lines for the tic-tac-toe board and small crosses on the bottom corner of the remaining fingers. 6. You can further decorate your nails by using glitter dust/rhinestones. Use tweezers or a toothpick to pick up the rhinestones and place it wherever you fancy! Now, isn’t it cool? 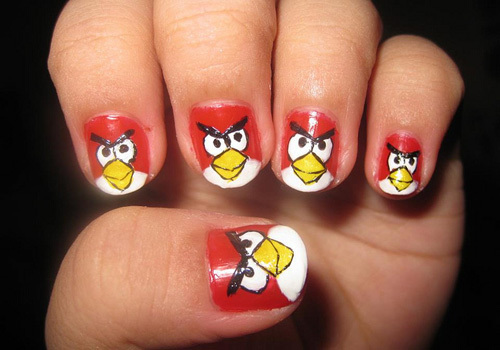 Here is another awesome game inspired nail art design especially for those quirky ones who like their game of cards! 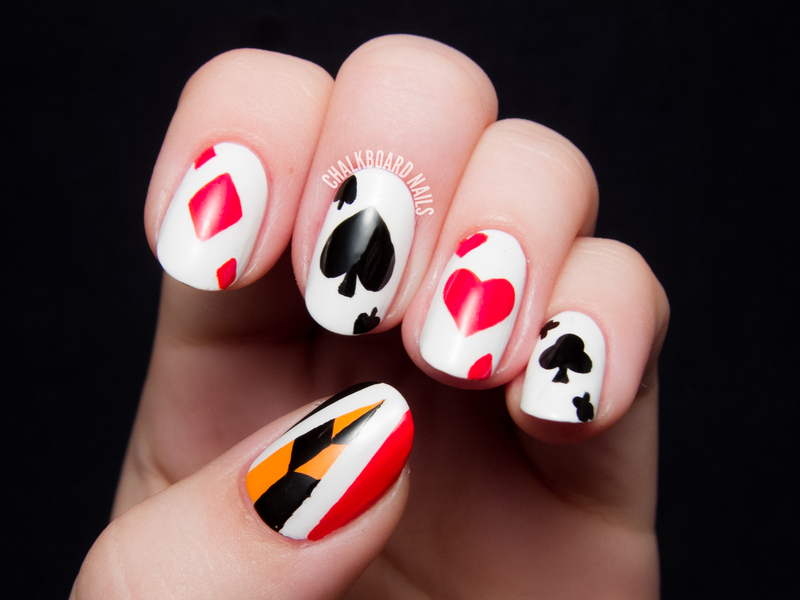 I am talking about superb nail art designs inspired by playing cards. Yes! The hearts, the spades, the diamonds and the clubs! You can create freehand motifs with red and black color against the white base coat. And, if you are feeling super sporty, then you can capture the mood and mania of the popular national or international game. Take a look at this design which is all about the true spirit of Olympics held in Britain. The fans went berserk and here is how they showed their patriotism.